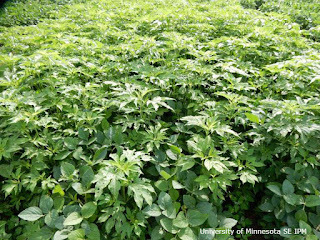 Research conducted in Rochester, Minnesota, this summer suggests that Liberty (glufosinate) herbicide can be a viable weed control option when herbicide resistant giant ragweed is present. 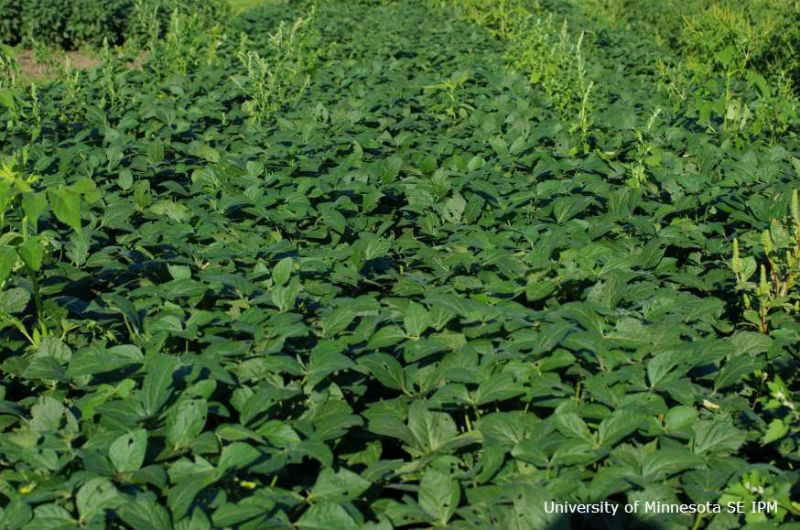 Roundup (glyphosate) and Liberty (glufosinate) systems were compared in soybean where giant ragweed populations were resistant to both ALS (SOA 2) and glyphosate (SOA 9) herbicides. Three types of applications were made in both the LibertyLink and Roundup Ready systems: 1) Preemergence application (PRE) followed by postemergence (POST) application(s) of Liberty OR Roundup. In the Liberty system, two POST applications of Liberty were made; 2) Two-pass POST applications of Liberty OR Roundup with tank mix partners; and 3) Two-pass POST applications of Liberty OR Roundup without tank mix partners. Preemergence herbicides and tank mix partners for application tactics 1 and 2 can be seen in Table 1. Liberty (SOA 10) by itself or in a tank mix provided giant ragweed control through the end of July (Table 1). However, weeds such as common Lamb's Quarter and waterhemp are also present in the same field and previous work has shown that three-pass systems that include a preemergence herbicide are the most effective in providing season-long weed control (Behnken, L.M., et al., 2014). Figure 1 illustrates the need for including residual herbicides to control all weeds. By the end of August, the sequential PRE + POST treatment had the best control (Figure 1a), compared to the two-pass POST application systems (Figure 1b-c). Roundup (SOA 9) treatments are shown in Figure 2a-c. Since the giant ragweed population is predominantly glyphosate-resistant, the 2-pass Roundup only results (Figure 2c) are not a surprise. The level of control seen in Figure 2b demonstrates what can be achieved with proper timing (2 inch weeds) and use of effective tank mix partners. Figure 2a illustrates the influence large weed densities can have on reducing the effectiveness of traditional two-pass PRE/POST systems. If planting Roundup Ready varieties, including a SOA 14 (PPO inhibitor, such as Cobra) herbicide is essential for good resistant ragweed control. 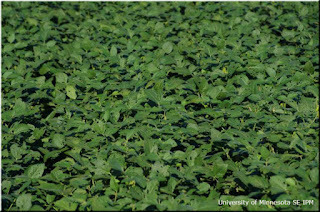 Crop injury will occur with these herbicides, but it is quickly becoming a condition for satisfactory weed control. Figure 1a. Liberty #1. 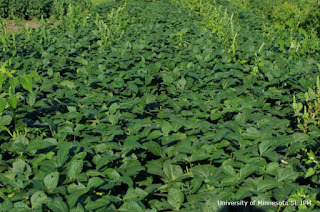 Three-pass system in LibertyLink soybean, including a PRE application of Verdict and Zidua followed by 2 POST applications of Liberty. Figure 1b. Liberty #2. Two POST applications: Liberty + Prefix applied 6/9 followed by Liberty 6/25. Figure 1c. Liberty #3. Two POST applications of Liberty (6/9 and 6/25). All photos were taken 8/25/15. Figure 2a. Roundup #1. PRE application of Verdict + Zidua followed by a single POST application of Cobra + Roundup. Figure 2b. Roundup #2. POST application of Prefix + Roundup 6/9 followed by Cobra + Roundup on 7/3. Figure 2c. Roundup #3. Two POST applications of Roundup only 6/9 and 6/25. All photos taken 8/25/15. In this study, the most durable weed control was the Liberty system that used a preemergence herbicide (effective on giant ragweed) application followed by timely (2 inch weeds) post application(s), since weed species other than giant ragweed also needed to be controlled. In addition to good weed control, it also had among the lowest herbicide injury ratings throughout the season (data not shown). 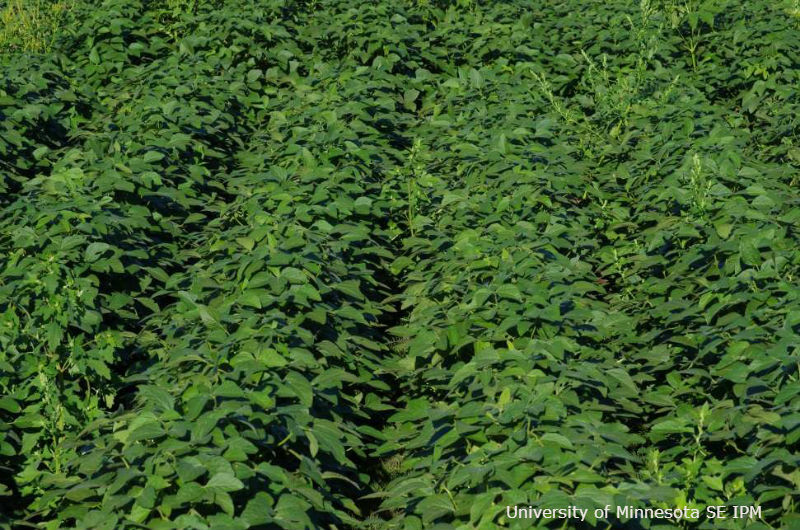 In general, relying on total POST systems greatly increases the risk for weed control failures or poor performance, due to weeds becoming too large and/or poor spray coverage. If weather limits the application window for PRE herbicides, leaving a total POST system as the only option, the POST systems that included Prefix (Treatments L2 and R2 in Table 1) and were followed by an additional POST herbicide application provided better overall weed control results than two POST applications of either Liberty or Roundup alone. Select a preemergence herbicide that is effective on giant ragweed. Follow it with a timely POST application(s) of Liberty (glufosinate - SOA 10) and/or a PPO herbicide, such as Flexstar, Cobra, etc. Whether using the LibertyLink or Roundup Ready systems, weeds need to be treated at the correct stage (2 inches) and proper application practices for contact herbicides need to be used. Manage the seedbank. Remove escapes and mow fence lines by early September to avoid spreading seed through the combine. Overuse of SOA 10 (Liberty) and SOA 14 herbicides is a concern and could result in giant ragweed becoming resistant to both of these SOAs. 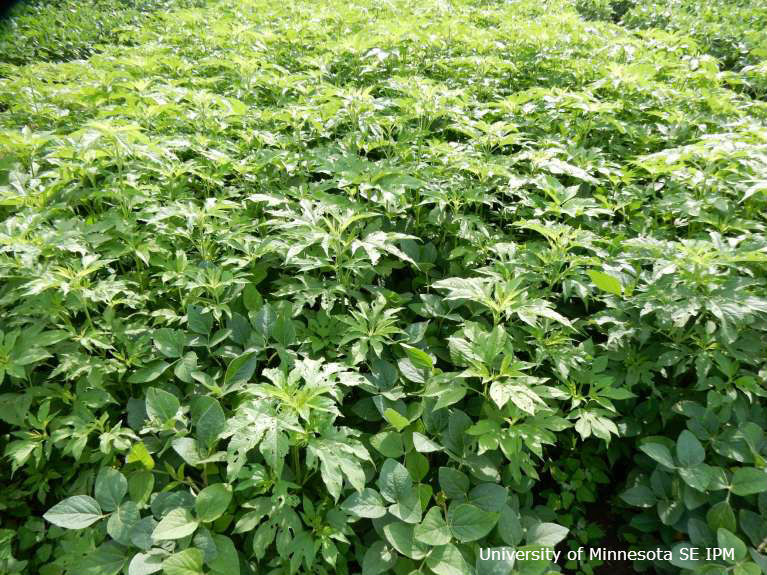 Waterhemp populations in Minnesota are already becoming resistant to SOA 14 herbicides because of repeated overuse. 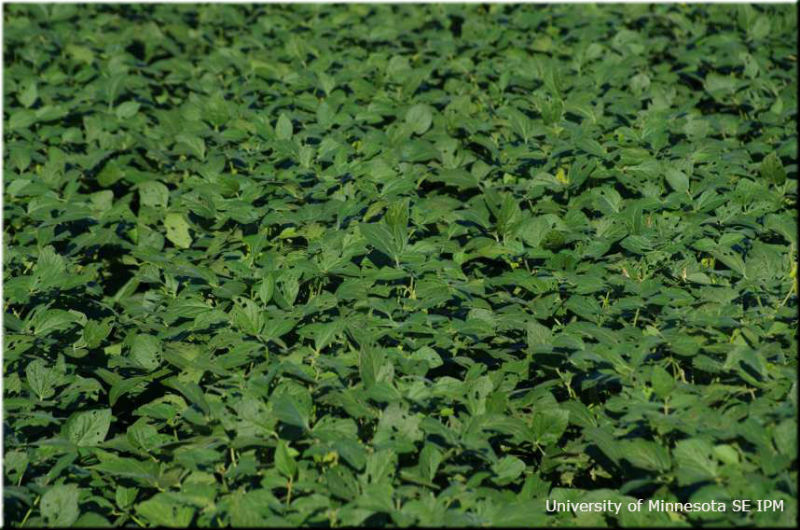 A diversified weed management plan is essential for maintaining herbicide effectiveness and minimizing the risk of resistance development. It is becoming evident that herbicide-only management systems to control resistant weed populations are going to be increasingly challenged and non-chemical strategies will need to be implemented. Stay tuned, as yield results and final weed control ratings will be available later this fall. 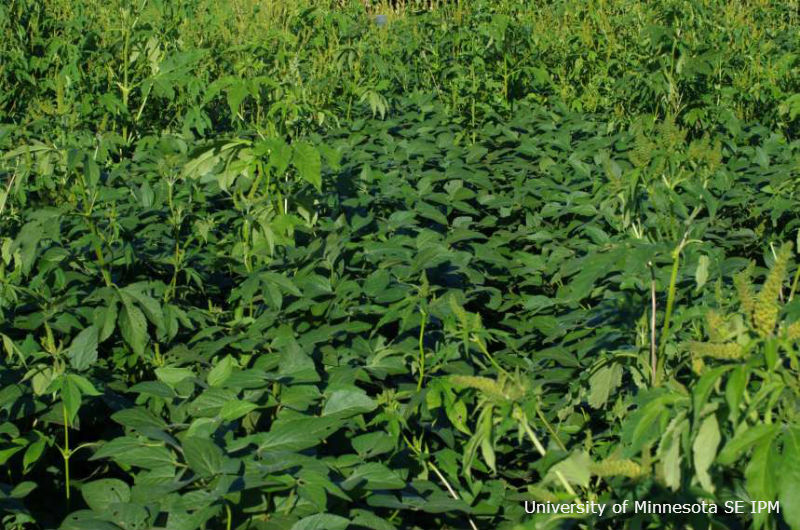 For more information about this research, see Glufosinate (LibertyLink) and glyphosate (Roundup Ready/GT) weed control programs for SOA 2- & SOA 9- resistant giant ragweed in soybean (Preliminary report). Table 1. 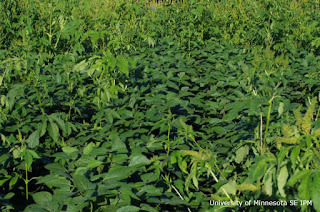 Giant ragweed control ratings for LibertyLink and Roundup Ready herbicide systems in sequential applications with preemergence herbicides, two-pass postemergence applications with tank mix partners, or as two-pass postemergence applications with no tank mix partners, Rochester, MN, 2015. Not all treatments or data are shown. 1Values followed by the same letter in the same column are not significantly different at the p=0.10 level. 2SOAs of herbicides: Verdict (14, 15); Liberty 280 (10); Prefix (14, 15); Roundup PowerMax (9); and Cobra (14). 3Time of application: PRE - 5/23; POST I - 6/9; POST II - 6/24; POST III - 6/25; POST IV - 7/3; and POST V - 7/10; All post applications were made when weeds were 2" tall. Behnken, L.M, F.R. Breitenbach, A.M. Lee, and A. Roerish. 2014. 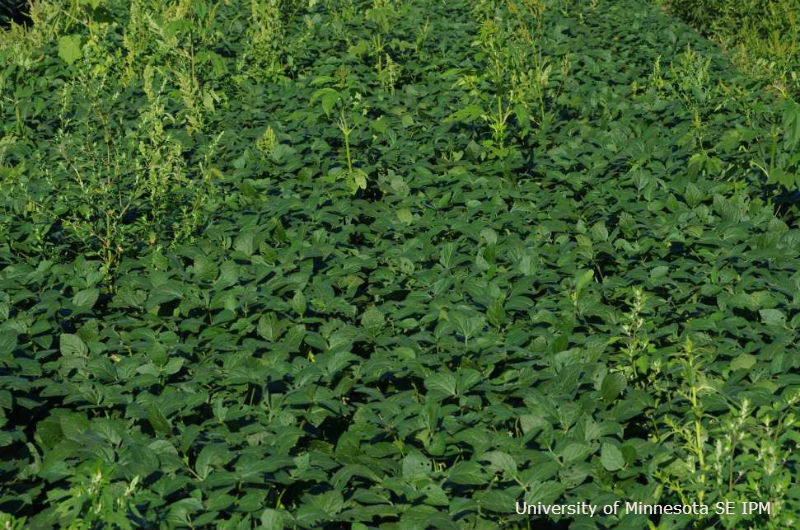 Glyphosate and ALS resistant giant ragweed control in soybean in SE Minnesota in 2014. University of Minnesota. 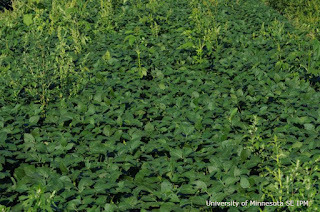 Available at http://www.extension.umn.edu/agriculture/crops-research/south/2014/docs/2014-soybean-glyphosate-and-als-resistant-giant-ragweed.pdf. 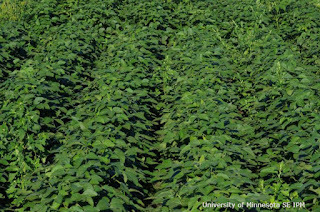 Research partially funded by the Soybean Research and Promotion Council.